Installation with 8 plastic beach balls, 19 foam balls, 1,200 golf tees, 25,000 sequins, 2,400 pearl pin heads, 1,000 pom-poms, 125 1mL syringes, 25 15-mL Falcon tubes, 10,000 half-dome pearls, 12,000 Pony beads, 7,500 straight pins, 2,000 seed beads, 1,000 pipette tips, 150 petri dishes, 1,000 Nalgene bottle caps, 1,200 rhinestones, IV tubing, wooden bamboo skewers, plastic dog toys, 1,000 thumb tacks, glitter, plaster gauze, acrylic paint, fishing line. The creation of this particular installation, Viral Storm, was inspired not only by books I’ve read about viral pandemics, but also murmurings in the news regarding “the next pandemic”, specifically avian influenza and the SARS and MERS coronaviruses. In the past decade, we have seen the emergence of viruses that are resistant to our medicines, or prove able to mutate quickly in order to avoid detection by the immune system after vaccination. We constantly struggle to keep up with the rate of mutation of these pathogens, and that struggle is compounded by the failures or absence of necessary public health infrastructure in many parts of the world. In addition, globalization and intrusion into parts of the world once occupied by only a small population of human individuals has led to the emergence and spread of new and/or newly resistant viruses threatening to become deadly global pandemics. 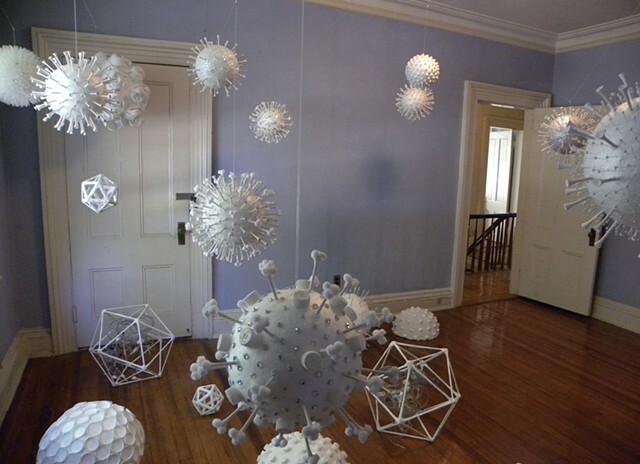 The sculptures serve as artistic representations of influenza (many subtypes), the SARS and MERS coronaviruses, and Nipah/Hendra paramyxoviruses, whose symmetrical forms have been created using medical laboratory materials (syringes, masks, IV tubing, Eppendorf tubes, pipette tips) in combination with glittery craft materials such as sequins, rhinestones, beads, and pom-poms. Disease [caused by pathogenic organisms such as viruses and bacteria] can easily become an abstract term for the damage that organisms inflict on the human body. By making these organisms macroscopic, we are confronted with their structure as physical, living* things, giving a “face” to the origin of many horrific diseases. It is much easier to confront something if we can see it; here, we now have a concrete visual, an unavoidable embodied form that we can attribute to our suffering. It is humbling to perceive seemingly simple, and rather stunning, organisms, so much smaller than our human bodies, and recognize our own susceptibility to them.